Resident Physician of the New England Hospital for Women and Children. 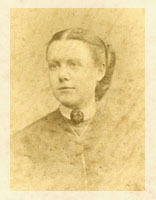 Dimock, Susan, M. D., 1847-1875. Boston: Press of John Wilson & Son., Cambridge, 1875. Illustrated: frontispiece mounted albumen portrait. The above albumen portrait is linked to an enlargement. Perished in the wrecking of the SS. Schiller on May 7, 1875 at the briefly burgeoned age of 28 years. 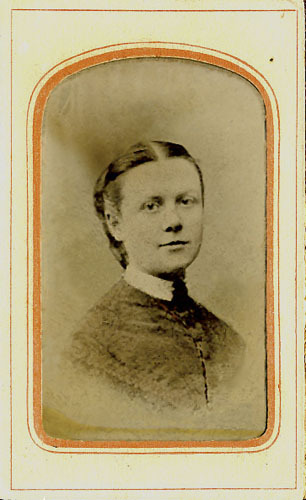 Extraordinarily gifted young woman who overcame all adversities to become a beloved physician, Susan Dimock began her education under the homespun tutelage of her mother and aunt who operated a small private school and her father Henry, who was also a teacher and editor of The North State Whig. She soon surpassed her father in Latin, but the war of the rebellion and his death in 1864 interrupted her studies and left the family destitute. Moving to Sterling Massachusetts with her mother in the year 1864, Dimock fully realized her passion for medicine and began reading every textbook she could come by. After teaching school for a less than a year, she took an apprenticeship at the New England Hospital for Women and Children and began to prepare an earnest application to Harvard Medical School. Her application twice rejected, she found acceptance in the medical schools of Zürich, Vienna and Paris, graduated with honors in spite of the unfamiliarity of the languages and cultures, and returned to America in 1872 to become the resident physician for New England Hospital. With her tenure at the New England Hospital and with the changes she inaugurated, in particular the first institutional training for nurses in the country, the hospital prospered. The repute of her surgical skills was still establishing when she died and her community mourned for the life that could have been. The only likenesses of Dr. Dimock existing at the time of her death were due to the blessed art of photography. None of them are entirely satisfactory to her friends, since it was impossible, in mere mechanical light and shadow, to reproduce the brightness of her countenance and the bloom of her color; but they all have value as records. The portrait placed at the beginning of this memoir was taken at Vienna [ca. 1872] during her residence there as a student, and therefore represents her as somewhat younger than when she was most widely known in Boston. It is, however, generally regarded as the best photograph existing. The latest one is a little ambrotype, taken with her pet dog for her mother. From these sources, an oil picture of Dr. Dimock was painted after her death by Mr. Edward L. Custer, of Boston. This picture was given to Mrs. Dimock for her lifetime; and, after her death, is to be placed in the New England Hospital for Women and Children. The above tintype was found within the pages of this book and is quite likely the memento of Mary Katherine (Kathleen) Bogart, the daughter of Gilbert Bogart whose school Susan Dimock attended for one year at the age of 13. Kathleen's autograph is on one of the flyleafs in the book and an annotation in the same hand appears on page 7., correcting the spelling of her family name. Even during her student years in Switzerland, Susan Dimock's thoughts were directed to changing the status of women at home in America. In this letter to the editors of the Boston Medical and Surgical Journal she announces the progressive government sanctioning of the training of women doctors in Switzerland.